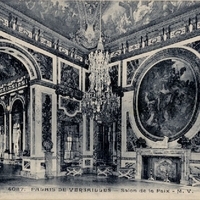 This postcard depicts the Salon de la Paix, or Peace Room. Located off of the Hall of Mirrors, the Peace Room was decorated by Charles Le Brun with panels of the peace given to Europe by France. After the reign of King Louis XIV of France, it was separated from the hall by a mobile partition and made part of the Queen's Grand Apartment. "The Hall of Mirrors." Chateau de Versailles. http://en.chateauversailles.fr/decouvrir-domaine/chateau/le-chateau/la-galerie-des-glaces/la-galerie-des-glaces/le-salon-de-la-paix-0. “Salon de la Paix Postcard.” RICHES of Central Florida accessed April 19, 2019, https://richesmi.cah.ucf.edu/omeka/items/show/6610.